Louise Bresler, 70, of West Bloomfield, Michigan, died on 4 September 2014. A Funeral was held at IRA KAUFMAN CHAPEL on Monday, 8 September 2014 at 12:30 PM. Rabbi Harold Loss and Cantor Michael Smolash officiated. 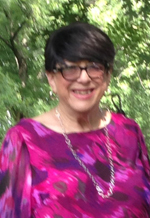 The family of Louise Bresler gathered through the evening of Tuesday, September 9 at the residence of Lenore Freed, 6420 Apple Grove Ln, Bloomfield Hills MI 48301 for friends to call. The phone number is 248-737-2246. Cherished sister of Lenore Freed and Phillip (Iris) Bresler. Dear sister in law of the late Jack Freed. Loving Aunt of Joni (Bill Seikaly) Lipson, Beverly Freed, Larry (Laini) Freed, Ben Bresler and Steven Bresler. Great aunt of Zachary & Ross Lipson, Joshua, Danny Jake Freed, Javan & Shane Bresler. Her Career: Louise taught English for most of her 40 year career in the Madison Heights School District at Wilkenson Middle School. A lover of books, she influnced untold numbers of children. She committed to the Holocaust Memorial Center seeing that her 8th grade language art students visited the Center on an annual basis. Upon her retirement one of her former student, now teaching at Wilkenson, has continued the tradition.